My main point of consideration is using the reliquary of Blessed Charles Augustus as a portrait. The reliquary dates from 1349, over 500 years after Charles' death, so it's not very reliable as a portrait. 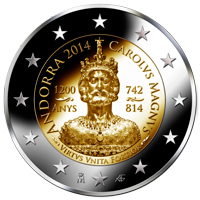 Meanwhile, there are good contemporary portrait coins of the emperor. While the reliquary suggests a tall, perfectly shaped, bearded man, the coins show him as having a round face with a short neck and a bare chin. That suggests a short, somewhat fat man to me, shaved as a Frank. The reliquary dates from 1349, over 500 years after Charles' death, so it's not very reliable as a portrait. Meanwhile, there are good contemporary portrait coins of the emperor. Here is one; now whether that would be better as a "model", I don't know.